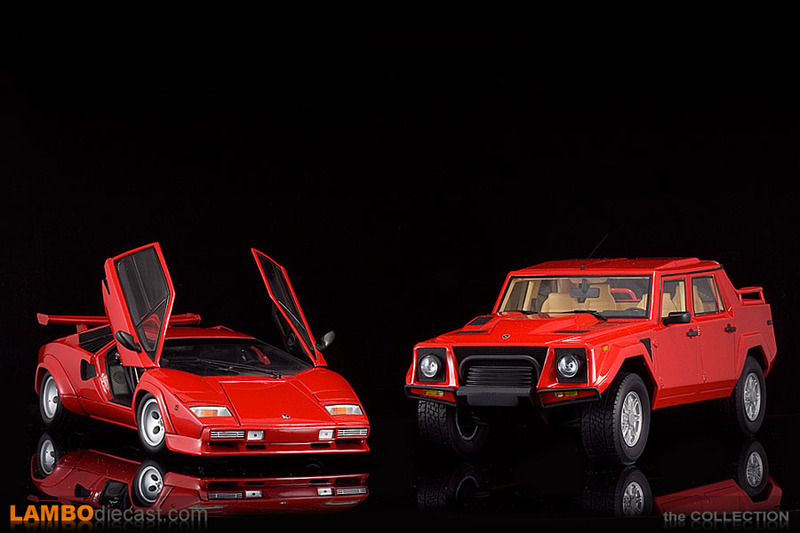 I have been a fan of Lamborghini from back in the Eighties, that is a long time ago and back in those days the Countach was still the flagship, together with the Baby Bull that was called the Jalpa and something really different ... the massive LM002. 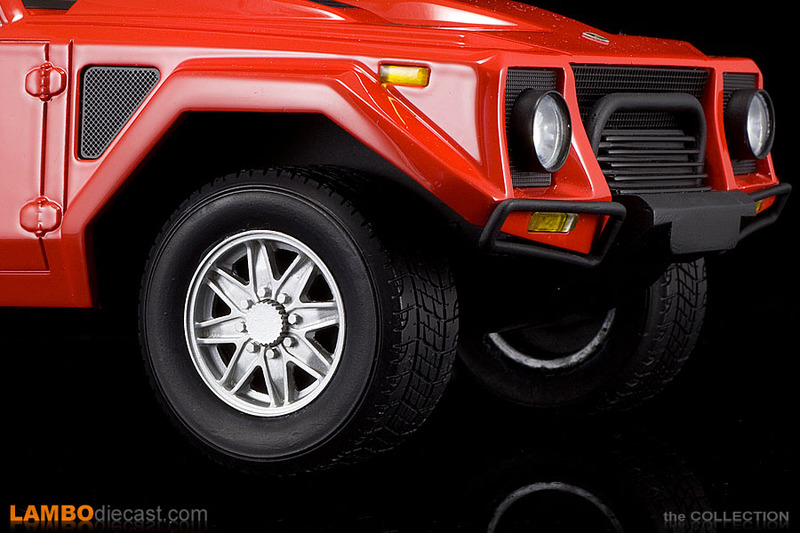 The Countach and the Jalpa might have had some competition back in the 1980's, but the mammoth LM002 just had nothing even come close ... we are talking about a massive V12 powered, 455hp four wheel drive off-road vehicle that was initially developed with military use in mind ... in fact a lot of controversy has been going around about the name LM002, some say it stood for Lamborghini Militare while other insist it is an abbreviation for Lamborghini Mimran ... named after the owner of Automobili Lamborghini SpA back then ... Patrick Mimran. 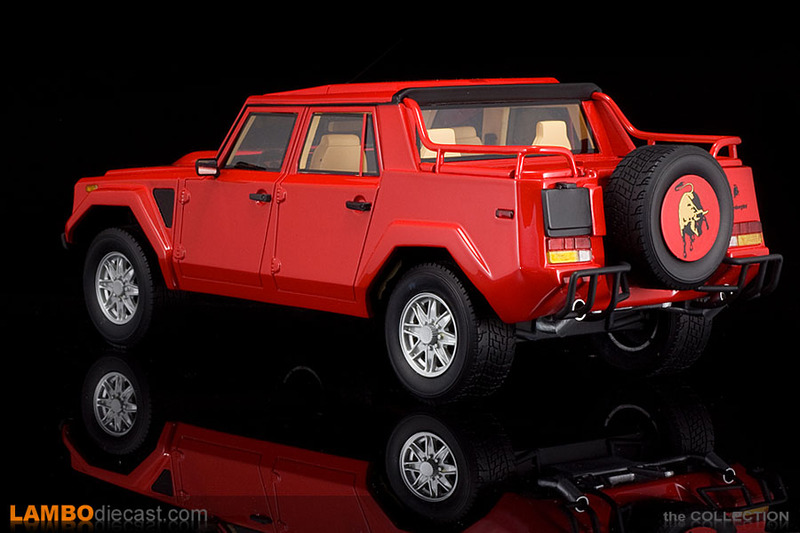 How about some impressive figures on the Lamborghini LM002: only 301 were built between 1986 and 1992, being 4900mm long, 2000mm wide and a massive 1850mm high the LM002 puts 2700kg on the scales ... and still she can reach a top speed of 210 km/h (130 Mph). 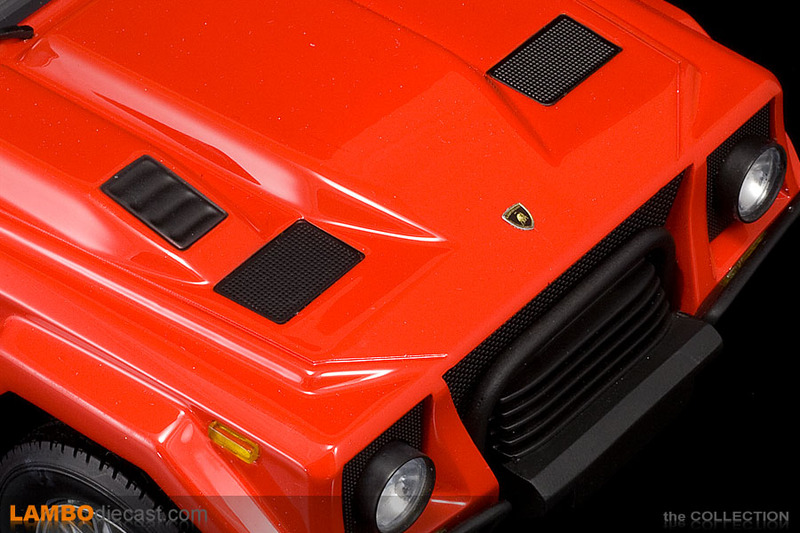 Under the hood the first LM002 series received the massive 5.2 Liter V12 engine derived from the Countach, later on the fuel injected model that would also be used in the Diablo found a place under the hood, which showed various 'bulbs' to house air filters ... remember this car was meant to be driven in some seriously bad circumstances like dry desert sand ... but also be able to use less than perfect fuel ... you could hardly call the LM002 economical ... fuel consumption was a whopping 30 Liter per 100 Km. 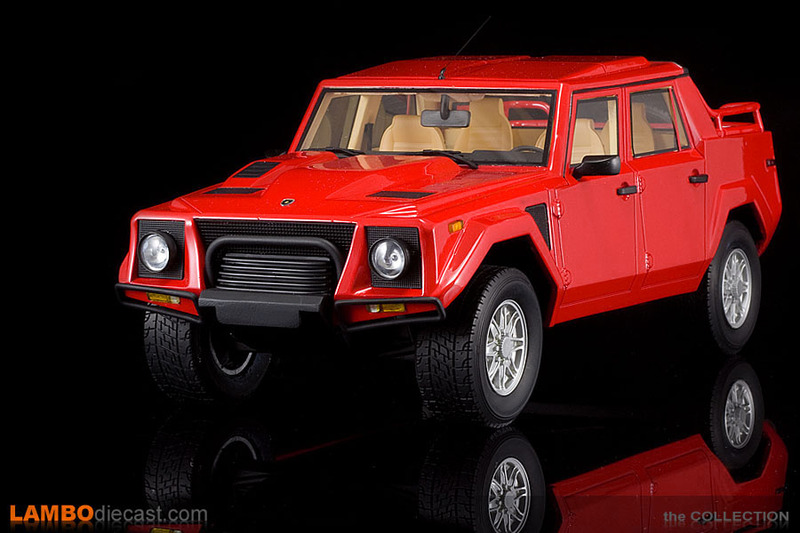 So in the end most of these Lamborghini LM002 went to Middle Eastern owners but still some made their way into the United States and various countries in Europe ... these days they have become a rare sight, the last series of LM002 production were special edition 'LM American' models, using a fuel injected engine these final LM002 received chromed bumpers, side skirts and beautiful OZ Racing alloy wheels ... in 1992, the last year the LM002 was produced only 12 units left the doors in Sant'Agata. 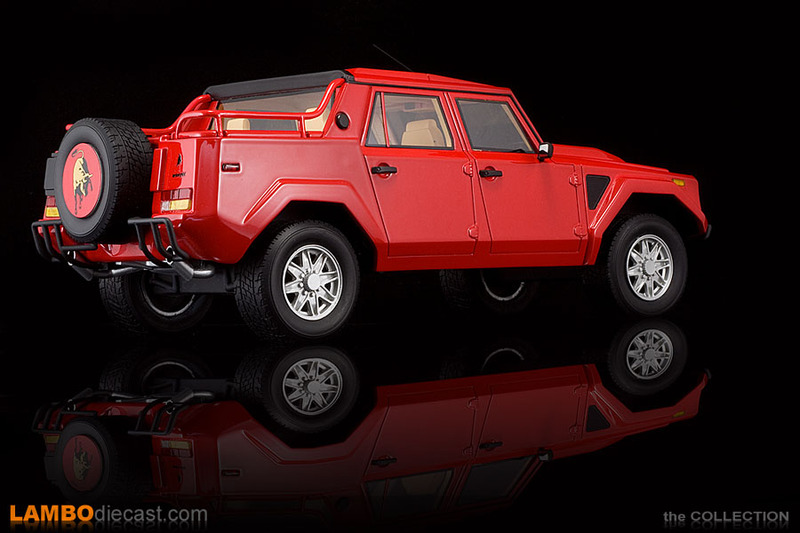 So it is safe to state the Lamborghini LM002 isn't the best known model made in Sant'Agata, cars like the Miura, Countach, Diablo, Murciélago and Aventador make most people stand in awe ... the LM002 will have them covering their ears instead ... thinking about Lamborghini as an exotic car builder just doesn't line up with a square style off-road vehicle ... but still the LM002 is a real Lamborghini ... loud, fast, expensive ... and with four leather seats inside it offers some serious luxury too ... at a price naturally. 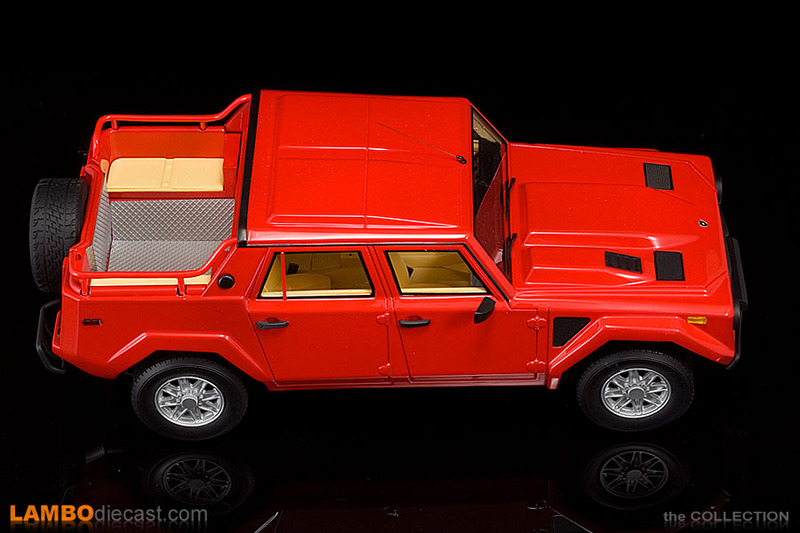 Until now there is none of the well-known high end scale model cars builders offering a large 1/18 scale model of this mammoth ... however there is one resin builder putting it on the market these days. 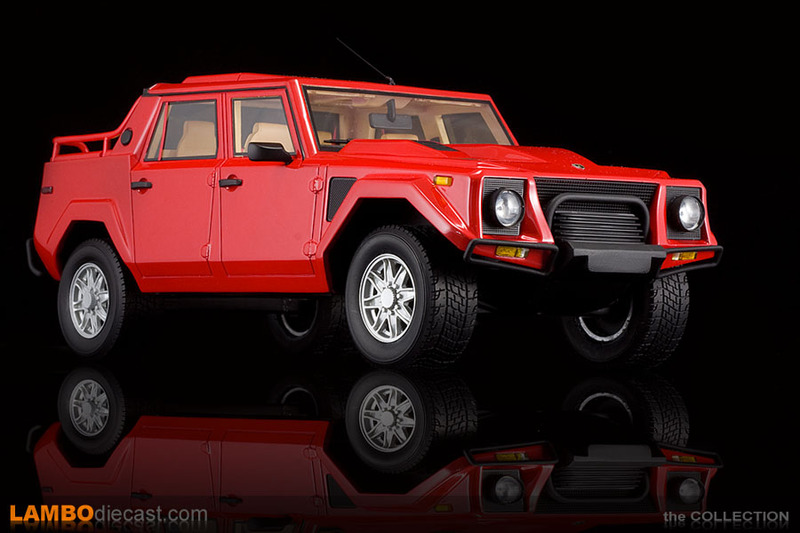 I admit it is a sealed resin model, and I'm not a real fan of those, but this is the only large scale Lamborghini LM002 on the market, so after some hesitation I went ahead and reluctantly ordered one from a Chinese seller on eBay ... fearing the usual long wait and high import taxes. At first two different shades were available, white and red ... 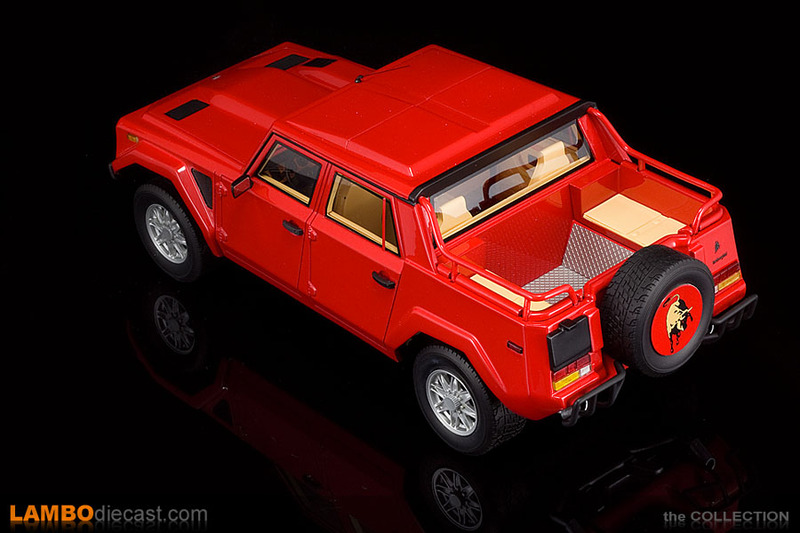 I went for the red shade because it was the only one to feature the optional OZ Wheels on it, the white 1/18 LM002 had the standard steel wheels instead ... and you have to admit red over a tan interior does look really nice too. Not willing to pay full price I made the seller an offer ... and rather unexpectedly he accepted, paid him ... and started waiting. 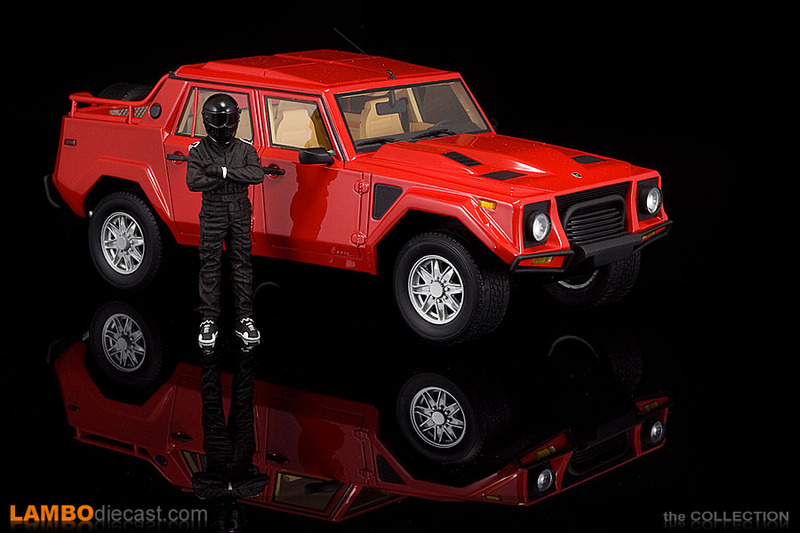 I usually don't buy models from outside of Europe anymore due to the high costs for customs and taxes, but with this LM002 I had no choice as it isn't available in Europe. I asked the seller for a tracking number ... twice ... never received an answer to my mails, but still he updated the 'listing' with a number after about a week ... that didn't work ... so I started worrying a little to be honest. 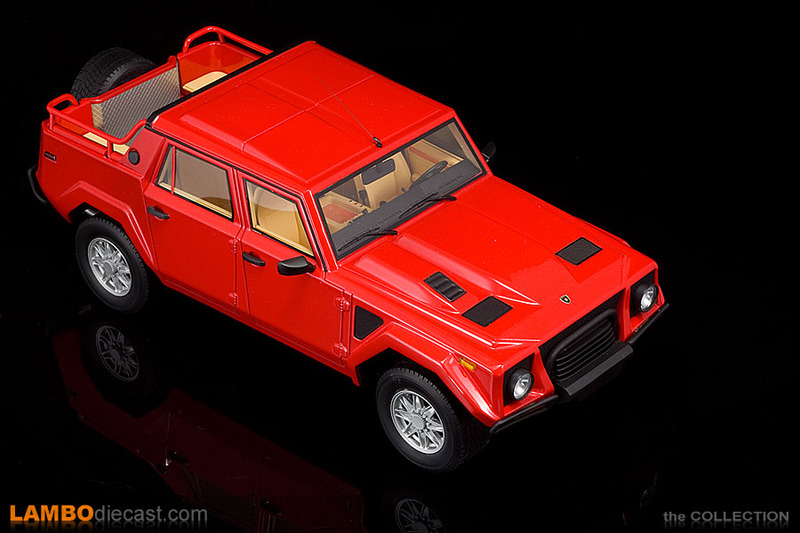 After waiting for about three weeks I was just about ready to put in a claim when a DHL van came up my driveway ... with a rather heavy box holding this bright red Lamborghini LM002 1/18 scale model ... I was impressive with the weight of this model in fact, it sure is a lot heavier than the resin MR models I own ... I would call that a good thing however. I was trembling a little opening the box, being shipped all the way from China anything could have happened during transport ... wheels can break off, windows can get damaged ... all kinds of nightmare issues kept going through my mind, keep in mind this isn't a cheap model and sending it back for a replacement would be expensive ... but it turned out alright. The seller really packed it very well for me, in fact he made sure the model couldn't move inside the box by using additional straps ... which pushed down the aerial on the roof, but no worries, it is a metal piece and I could 'bend' it right up again very carefully. 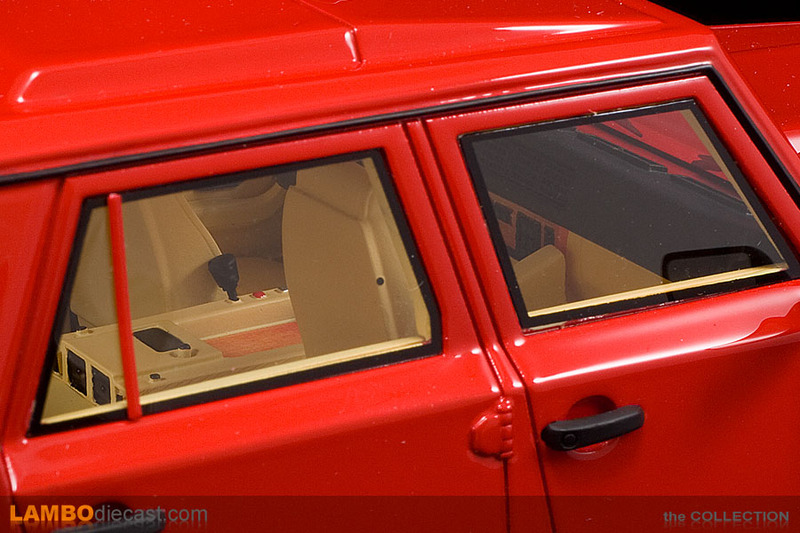 One other issue on my specific model was the rear side window on the left side ... it gave way so I have to glue it back in place, which isn't as easy as it sounds, the windows are very, very thin plastic. 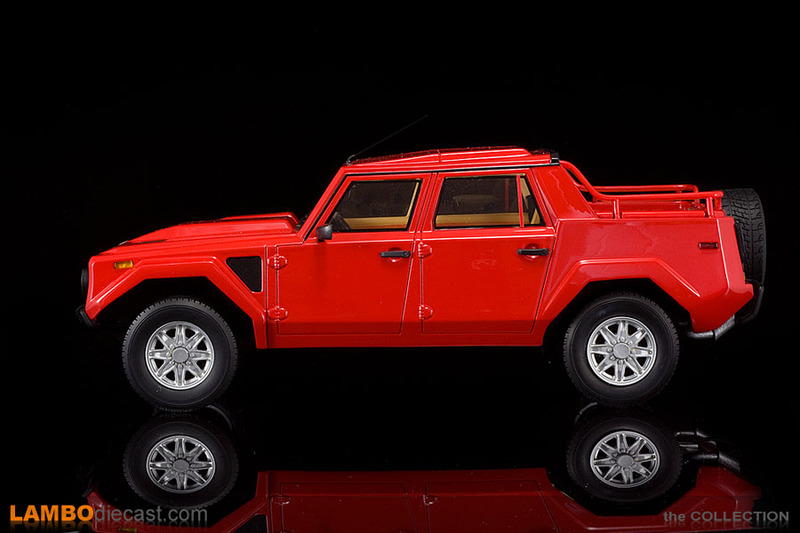 This Lamborghini LM002 comes screwed onto a plinth, four screws and large black spacers keep the model from moving around inside the classy black box complete with slip case ... very high end in fact. 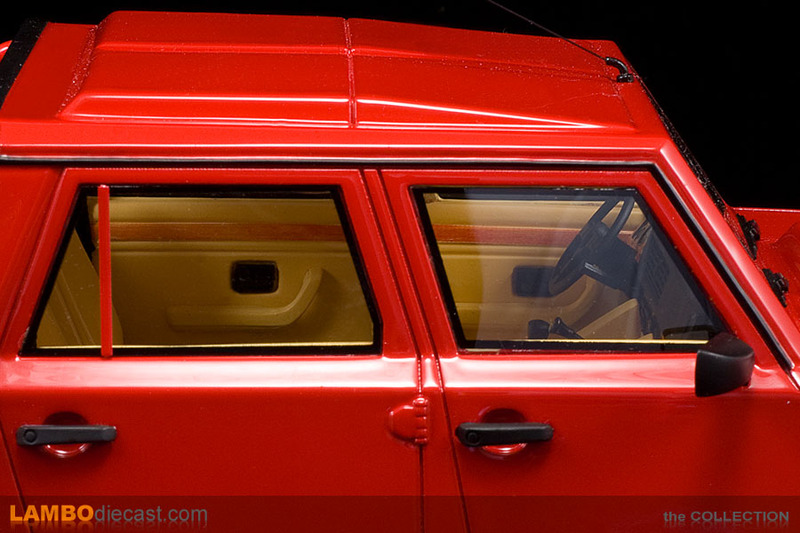 Do note the exterior rear view mirrors come separate inside a small plastic bag, they fit snugly inside openings on the doors ... but you should really glue them in place I feel, they tend to drop down anyway. So how does this resin model look in the end? Is it worth the $200 asking price or should you wait for some other manufacturer to offer it? Yes and no! I know that is a very confusing answer, but I will explain it for you. 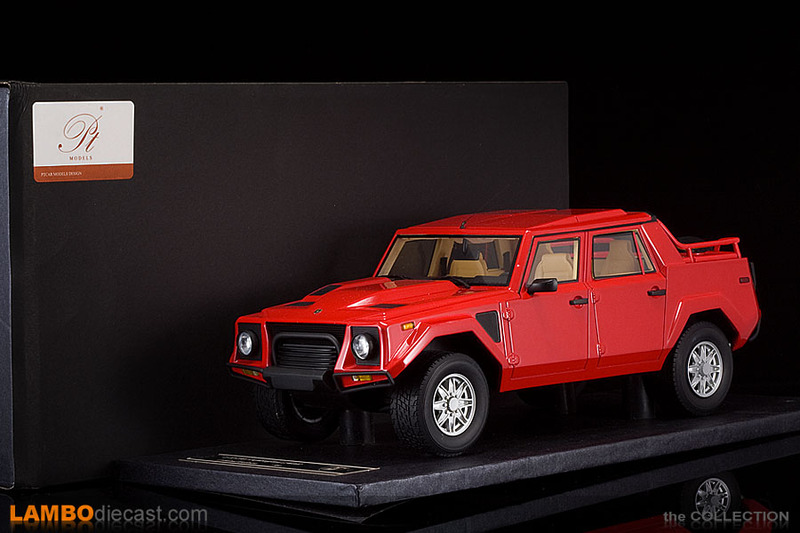 This 1/18 Lamborghini LM002 is the only one available on the market today, priced at $200 it is expensive, but not like an MR at $400 while a nice AutoArt will be at least as pricy if they would make the LM002 ... so this one is worth the price just for being the only one you can buy ... but it does have some flaws if you ask me. 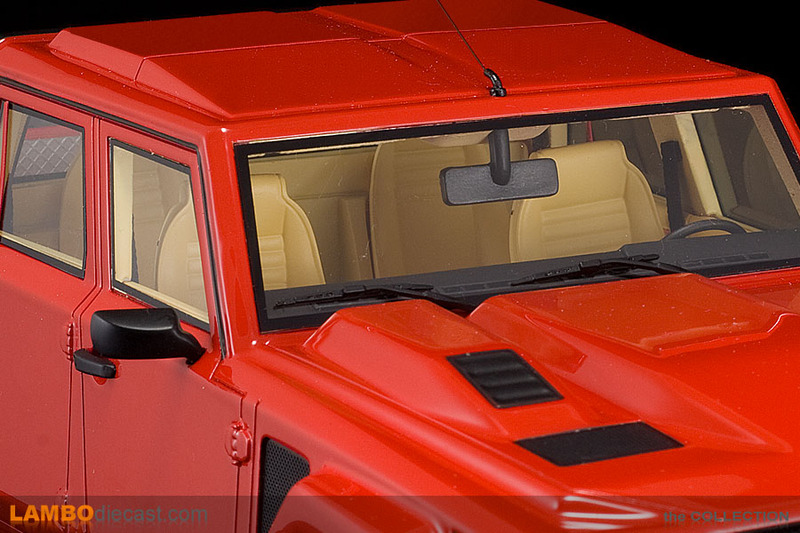 The first issue for many collectors is the fact this LM002 is a sealed resin model ... nothing opens, now this is normal for a resin model and I admit I usually display my models with everything closed anyway ... but still it would be nice to admire the very nicely detailed interior or take a peek at the impressive V12 engine under the hood. Now I knew this was a resin, so I'm not putting this down as a negative ... but I know many don't think so lightly about this. The paint on this model is very, very well. The red shade looks correct and offers a very nice, deep shine ... however it is applied in a very thick layer, this is visible on the door hinges in fact, that's why I'm not calling the paint finish perfect. Also some corners show some wear, more specifically the black section at the rear of the roof ... there is some red coming through again. As this model has orange side lights up front and red ones at the rear we can asume this is a model of an US-specs model, also the more rounded 'bulges' on the engine cover reveal this model to be a fuel injected model, so a later series edition, the black 'bumperettes' at the front and rear are usually finished in a dark grey in real life, but they can be black too, so this isn't a mistake. 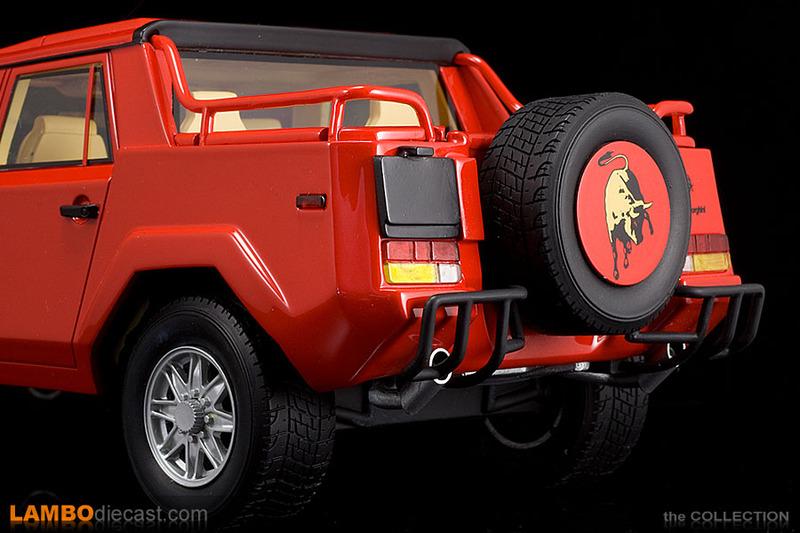 I also heard people talk about the Raging Bull on the disc over the spare wheel at the back, which again is a Lamborghini mounted item, it might not look very nice, but it is again correct, there are LM002 out there with a cover over the entire spare wheel, some with the disc seen on this model and even no cover at all ... also keep in mind there is a cover that fits over the entire rear section of the Lamborghini LM002. 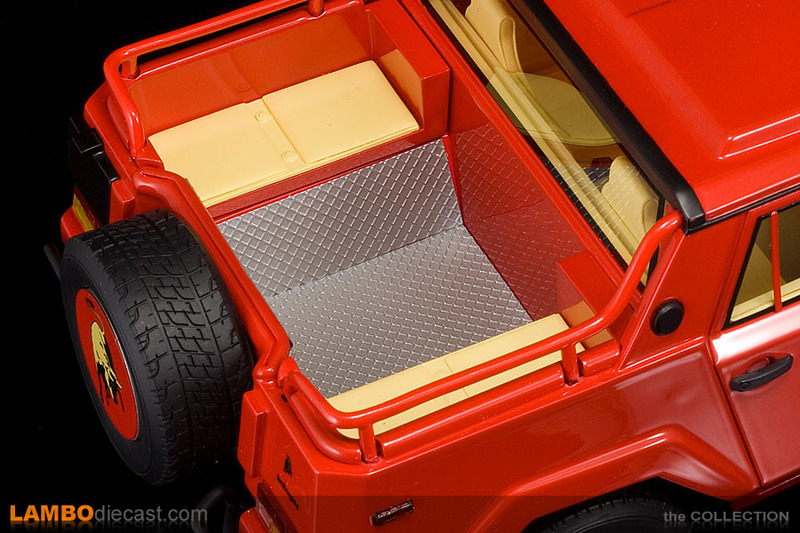 Fortunately this model shows the rear seating area found on the Lamborghini LM002 very nicely, there is metal plating replicated on the floor while the small cushions have the same upholstery as the interior ... just like on the real deal ... very impressive. 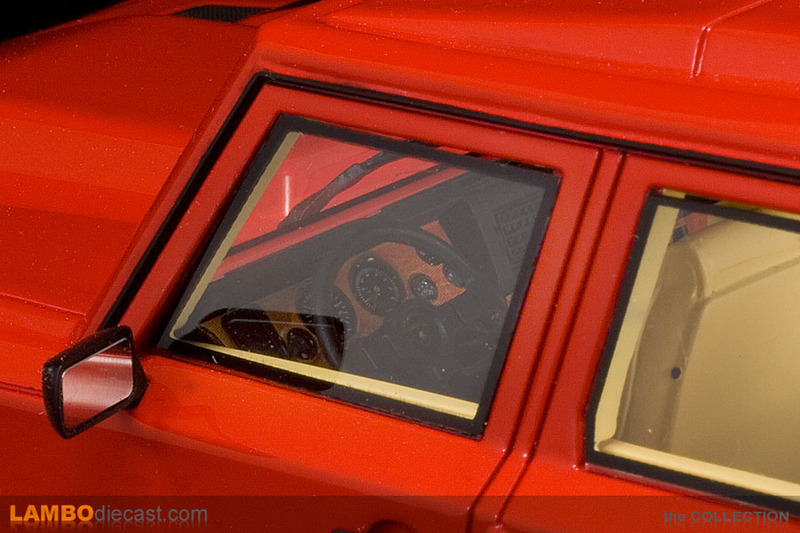 Which takes us into the very nice tan interior found inside this model ... I couldn't open any doors to photograph it, but did manage to take some shots through the windows, and I have to say the interior looks really, really nice. 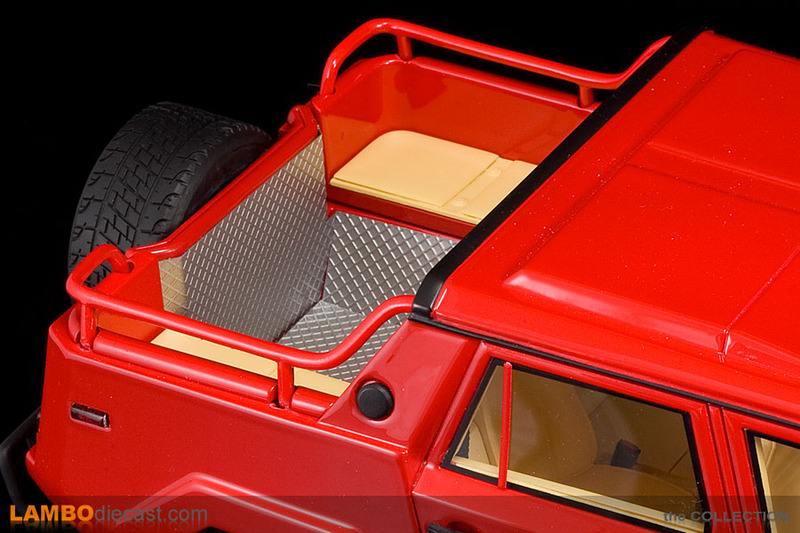 It all seems to be present and nicely detailed, even the dials on the dashboard look right, the gearshift is large and the second lever to 'disengage' the front wheels is present too as are the push buttons and other stuff ... even the stereo which in the LM002 is mounted inside a roof pod is scaled down to 1/18! So the attention to detail is very good on this model, one small item worth mentioning can be found on the wheels, being the optional OZ Racing Wheels units they should have a Lamborghini script on the hub ... that hasn't been scaled down on this model, but other than that I couldn't find many thing to worry about. 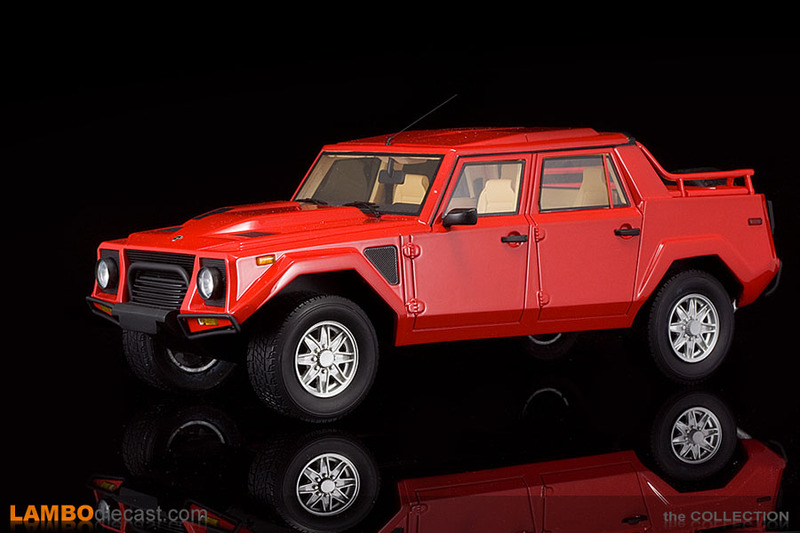 I already mentioned this is a very heavy model, but I guess that is a normal result from being large ... in real life the Lamborghini LM002 is a very big machine, which naturally translates into a large 1/18 model too. 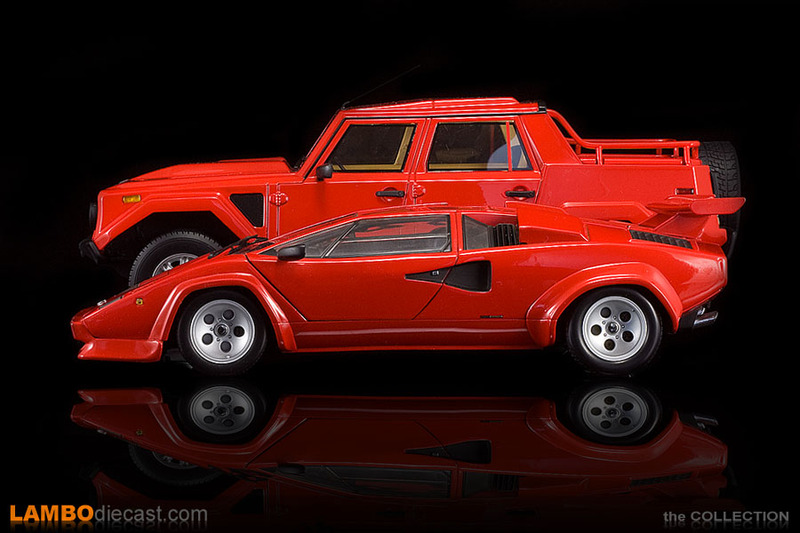 During the photo-shoot I put a 1/18 Lamborghini Countach LP500S by Kyosho next to it ... and it looked like a smaller scale model, the rear spoiler on the Countach doesn't even reach the upper door line of the LM002. 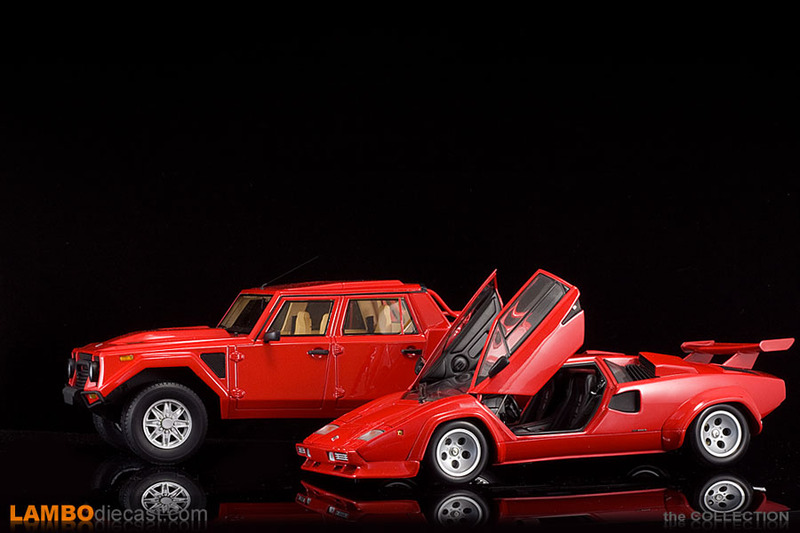 With the doors open on the Countach just about reaches the same height as the massive Lamborghini LM002, I specifically used a Countach model for comparison as these are from the same era, normally I should have used the Quattrovalvole edition, but I took this Kyosho made LP500S because it is the same shade as the LM002, making the side by side shots more interesting. 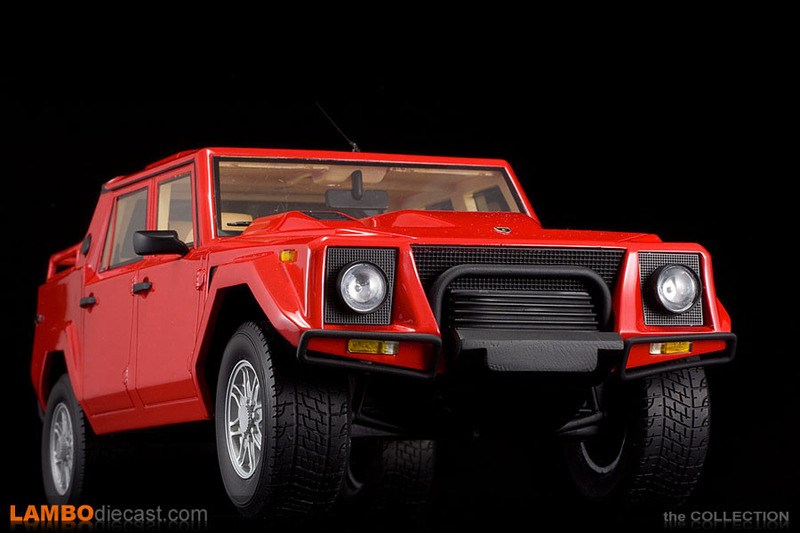 Back in the Eighties the Lamborghini LM002 received the nickname 'Rambo Lambo', and when putting her next to the very low Lamborghini Countach it becomes obvious why you would call her the Rambo among off-road vehicles. 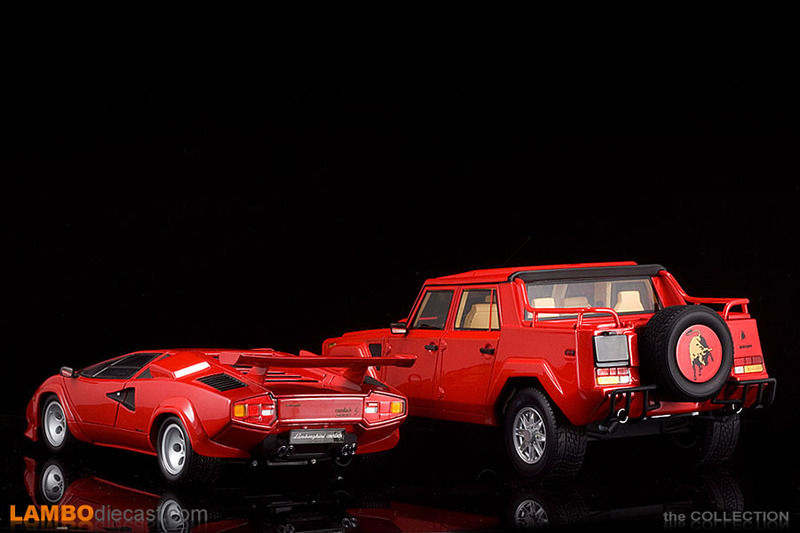 Even next to a more modern SUV like the Hummer H2 the Lamborghini LM002 looks larger than life, now I don't have a normal 1/18 scale model of the Hummer, but I did get one of those DUB tuning editions in black ... and side by side you get a very nice impression of just how big the V12 Lamborghini off-road is. 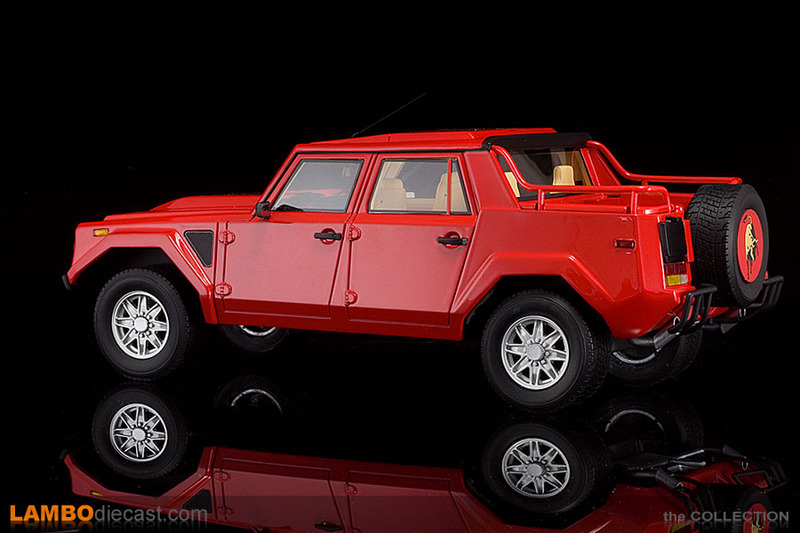 Bottom line: this is the only 1/18 scale model of the gargantuan Lamborghini LM002 from the Eighties ... which is reason enough to get this model, even at a $200 asking price. 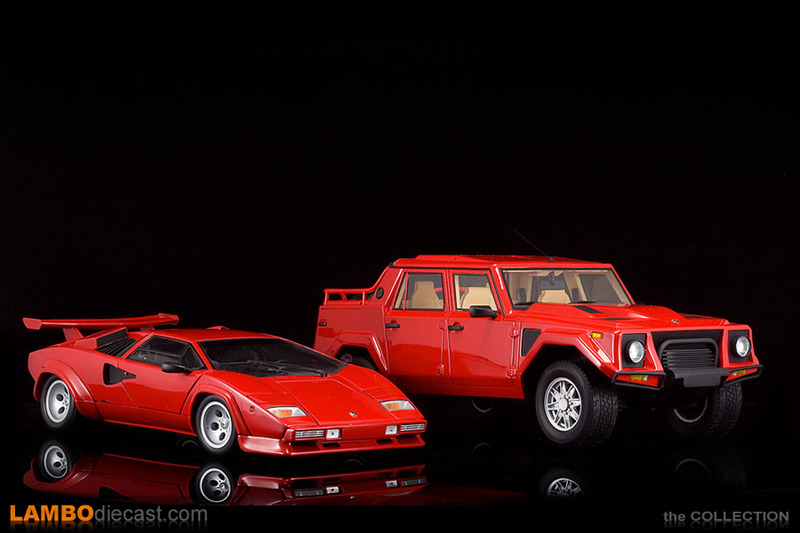 Which shade you should get totally depends on your preferences, I've heard many mention the OZ Wheels on this red model aren't to their liking, for me they were the principal reason to get this shade instead of the white one. Keep in mind we are talking about a limited edition model, only 99 units of each shade will be made, in fact there is a plaque on the plinth stating this, but there is no serial number, it just says 'limited edition /99' ... however white and red aren't the only shades available ... shortly after I ordered this model I saw it also comes in matte black, green and in a full camouflage 'dress' now ... still only the red one received the OZ Wheels, so I'm glad I went for this shade.